Sergeant 39762, Cecil Francis Quarterman, 24th Siege Battery, Royal Garrison Artillery. Cecil was born in Cold Ash in 1893, the son of Thomas David Quarterman and his wife Maria Ann née Weston. Thomas was a police constable, born in Great Haseby, Oxfordshire, Maria was from Leckhampton, Gloucestershire where they married in 1884. Moving to Berkshire to take up a job with the Berkshire Constabulary, first in Chaddleworth, then Cold Ash and finally in Newbury, they had five children: George, Annie, Cecil, Amy and Percy. All three sons served their country in the Great War, only George survived. The family lived at 8 Bartholomew Terrace in Pound Street. Cecil had a short walk to school at Newbury Grammar School, which he attended between 1907 and 1910. After school he first worked at Elliot's Albert Road Works; Elliot's were a major local employer manufacturing joinery products. Factory work may not have suited him as he moved on to work at Alphonse Cary's music shop at the north end of Northbrook Street. Cary's was the local source for musical instruments, sheet music, gramaphones and records; they also had a music room for concerts. In 1913 Cecil decided on another career change and enlisted in the Royal Garrison Artillery. His obituary (see below) gives a tantalising snippet of information - that he spent six weeks at the start of the war on a 'secret expedition'. A further snippet comes from his father's obituary printed on 5 May 1927: 'During the first few weeks of the war he volunteered for a secret commission on a French Submarine.' It is possible that this involved a trip to France and/or Belgium to assess the impact of the heavy German siege weapons on the French and Belgian forts. If so, Cecil	would	probably have	gone	along	to support the	officers	carrying	out	the	assessment. 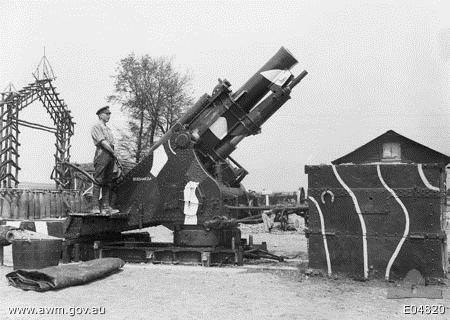 A 9.2 inch howtizer with an RGA battery in 1918. The Royal Garrison Artillery were the heavy artillery of the British Army, equipped with 6, 8, 9.2 or even 12 inch howitzers they operated from relatively fixed positions behind the lines. Their targets were the enemies heavy artillery and major strongpoints in their defences. Naturally they were targeted by their opposite numbers behind the German lines. The 24th Siege Battery were sent to France on 19 August 1915, just in time to take part in the Battle of Loos. 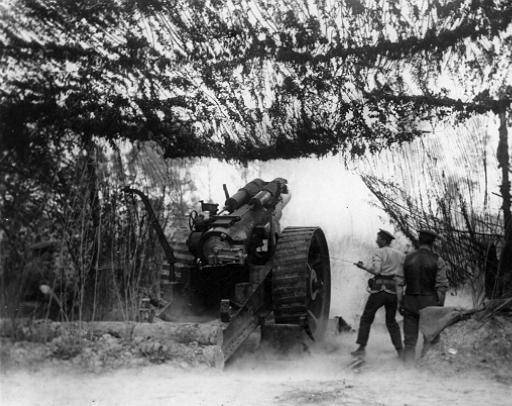 On several occasions the Battery were attacked with gas shells, Cecil suffering from their effects on several occasions. However, it was not a shell that sent him home, but a bullet in the shoulder from a German aeroplane that strafed his position in 1917. Bombadier Cecil Quarterman, RGA, son of PC Quarterman of Newbury, whilst acting as observer in France was spotted by an enemy aviator, who shot him through the shoulder with a machine gun bullet. He is now in hospital at Reading. Cecil was evacuated to hospital in England, first in Reading before being transferred to Albion House Hospital in Newbury to be nearer his family. Plaque commemorating the wartime use of Albion House. Albion House is at 27 Oxford Street; the site has been much altered to convert it for office use but the main house remains. 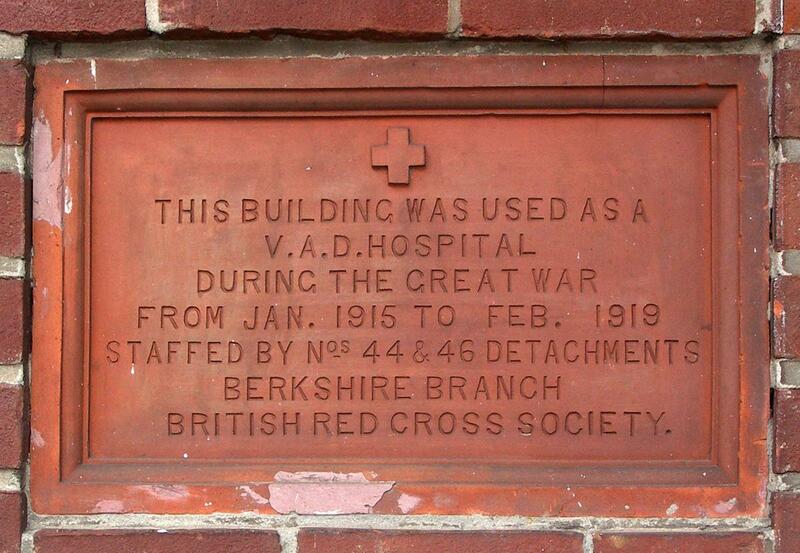 A terracotta plaque marking the building's wartime use has been retained on a rebuilt portion to the east of the main building. When he had recovered from his shoulder wound Cecil was posted back to the Artillery Reserve Brigade as Shoreham, where, in 1919, he became an instructor. In November of that year he attended an RASC camp near Winchester, but was becoming seriously ill. He was discharged from the Army in February 1920 and sent to the Peppard Sanatorium suffering from tuberculosis. By 10 June it was evident that the treatment at the Sanatorium was not having the desired effect and he was sent home to spend his last days with his family. On 21 July he died; he was 26 years old. He was buried in Newtown Road Cemetery in Newbury on 23 July following a requiem mass at St Joseph's Roman Catholic church. His grave is marked by a Commonwealth War Graves Commission headstone. 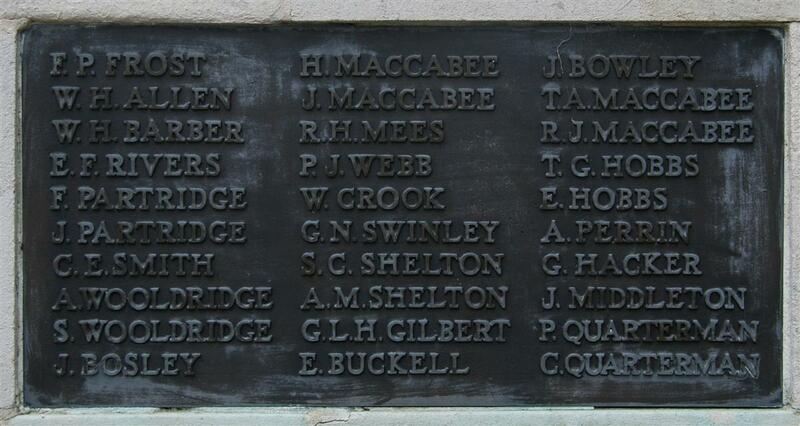 He is remembered on the Newbury Town War Memorial. The family of ex-P.C. Quarterman has recently suffered its second war bereavement through the death of Sergt. Cecil Francis Quarterman, from consumption from the after effects of gas. Sergt. Quarterman was educated at Newbury Grammar School, from 1907 to 1910, and was afterwards employed in the office at the Albert Works, and also at Mr. Cary's. He enlisted in 1913 in the R.G.A., and at the commencement of the war went on a secret expedition which lasted six weeks. He went to France in July 1915 with the 24th Siege Battery and saw fighting at Loos, through the Somme battles and at Ypres. He was gassed several times. In September 1917 he was shot through the shoulder from an aeroplane. He was invalided home being in hospital at Reading and Albion House. Recovering he was sent to the Artillery Reserve Brigade, at Shoreham, when in in 1919 he was made sergeant and educational instructor. In last November he went to the R.A.S.C. Camp at Winchester, but becoming so seriously ill he was discharged from the army in February last, and at once went into Peppard Sanatorium. He returned home on the 10th of the present month, and died on Monday last, at the age of 26. The funeral was yesterday, and Requiem Requiem Mass taking place in the St. Joseph's Roman Catholic Church and the interment being at the Newtown Road Cemetery. The mourners were Mr. T.D. Quarterman and Mrs. Quarterman, father and mother; Mr. G.C. Quarterman, brother; Miss Edith Quarterman and Miss Grace Quarterman, sisters. MR and MRS QUARTERMAN and FAMILY desire to return their sincere Thanks to all kind sympathisers and friends in their recent sad bereavement. Also to thank most sincerely the Doctor, Matron, Nurses and Orderlies at Peppard Sanatorium for their devoted attention during the 15 weeks their late son was at the Sanatorium. 8 Bartholomew Terrace, Enborne Road, Newbury. June 30th, 1920. It is with the deepest regret that we have to record the death of Sergeant Cecil Francis Quarterman from consumption following the after-effects of gas. This is the second war-bereavement suffered by the family, 2nd Lieut P H Quarterman, a brother, also having lost his life on active service. Sergeant Quarterman was educated at Newbury Grammar School from 1907 to 1910 and was afterwards employed at the Albert Works Office and also at Mr Cary’s. He enlisted in 1913 in the RGA and when war broke out went on a Secret expedition which lasted six weeks. He went to France in 1915 with the 24th Siege Battery and saw fighting at Loos, through the Somme battles, and at Ypres. He was gassed several times, and in September, 1917, he was shot through the shoulder from an aeroplane. He was invalided home, being in hospital at Reading and at Albion House. On recovery he was sent to the Artillery Reserve Brigade at Shoreham where in 1919 he was made Sergeant and Educational Instructor. Last November he went to the RASC camp at Winchester, but seriously ill, he was discharged from the Army in February, 1920, and at once went to Peppard Sanatorium. Three months residence there, however, failed to arrest the disease from which he was suffering, and he returned home on June 10th, to die. He passed away on Monday 21st June, at the early age of twenty-six. The funeral took place on Wednesday, June 23rd, a Requiem Mass being held in St Joseph’s Roman Catholic, and the interment at Newtown Road Cemetery. Although he was very little known to the present boys, no doubt he will be remembered by many of the old boys of the School. The deepest sympathy is felt with Mr and Mrs Quarterman and the surviving brother and sisters on their sad loss. Howtizer in action, Messines, 1917. Hill 60 was a slightly higher prominence on the low ridge that ran around the Ypres salient, about 3 miles SE of the town of Ypres - named from its height, 60m above sea level. It was not a natural feature, but a spoil heap created by the excavation of an adjacent railway cutting. Hill 60 changed hands several times through the course of the war. Owing to its height it was a prime position for artillery observation posts - spotting potential targets and feeding back to the batteries so they could improve their aim. The story of Cecil's brother, Percy, is told here.